barring our initial grocery shop. Sunday night, I used the last of the mixed salad greens. So we are down to only romain lettuce. That means Cesar salads from here on out! Last night, we made a great dinner that I wanted to share with all of you: ground meat kabobs with grilled veggies. They have a bit of a Middle Eastern influence, and they were so delicious! 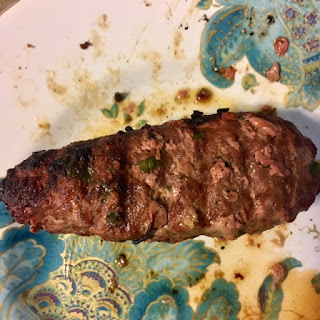 While putting ground meat on a kabob may not be the most obvious choice, it's totally wonderful. And you can grill it. YUM! For my kabobs, I used ground venison, which is my go-to meat. But you can use whatever ground meat you like best from turkey to chicken or beef. Here's a fun fact: the dinner we had last night, with the exception of the rice we prepared and the onions in the tomato salad, was grown right here in Sussex County--even the herbs. This was truly a locally sourced meal! You'll notice this recipe is rather "loose" and that's because I didn't take precise measurements on this one. But this is the sort of recipe that gives you a little play. Just use your judgement with the ingredients, and use what you have on hand--it's the "eat down" way! One final note, while you can totally make these and grill them, what I like to do is make them a couple of hours ahead and then let them sit in the fridge. I have found that they cling better to the kabob sticks this way. Place all the ingredients in a medium bowl. Get in there with your hands and mix it well. Divide the meat into 5 even portions. One at a time, roll the portions into "hot dog" like shapes. Push the skewer through the meat, long ways. Repeat with each portion. I then like to pop mine in the fridge and let them rest until I am ready to cook them. Prepare your grill (or you can use a grill pan on the stove, on medium high heat.) Cook your kabobs about 15 minutes or until done, turning to cook evenly on all sides. I served mine with rice and in-seasons grilled veggies (eggplant, zucchini and squash).